Delivering 80 watts of power, the CFX Vaporizer takes your vaping experience to the next level. This awesome power gives you the convenience of fast heat up time of about 20 seconds, depending on the temperature setting you choose. The CFX vaporizer has a tmperature range of 100-430 degrees Fahrenheit (38-221 degrees Ceslsius). Plus, the ceramic heating chamber ensures consistently pure and clean vapors. The CFX portable vaporizer by Boundless also boasts fast charging time of 30 to 45 minutes with the DC charger. The USB charger has a charging time of two to three hours. The Boundless CFX Vaporizer is ergonomically designed with a clean look and solid feel. It may not stand out in terms discreet vaping, but it’s size and form makes this device pcket-friendly. The Boundless CFX Vaporizer is powered by dual 2500mAh Lithium-Ion batteries that are rechargeable and replaceable. The Boundless CFX Vaporizer has a 5-minute auto shut-off for your safety and to preserve battery life. The Boundless CFX™ Vaporizer comes with a 2-year manufacturer’s warranty. The Boundless CFX™ Vaporizer is guaranteed to be free of manufacturing defects and in proper working condition when you receive your order. Should you receive a defective item, we will provide a replacement, free of charge. 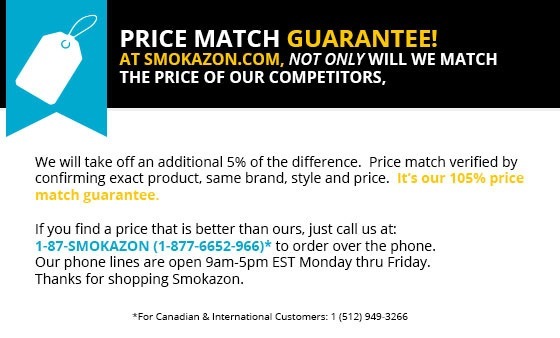 To obtain your replacement, contact Smokazon.com within 7 days after receiving your order.